ATMOS POWER PVT LTD is leading designer, manufacturer and supplier of all kinds of PSA Nitrogen Gas Plants and we are ISO 9001:2008 certified company. We offering customize capacity as per client requirement for different applications. Pressure swing adsorption (PSA) is a technology used to separate some gas species from a mixture of gases under pressure according to the species' molecular characteristics and affinity for an adsorbent material. It operates at near-ambient temperatures and differs significantly from cryogenic distillation techniques of gas separation. Special absorptive materials (e.g., zeolites) are used as a molecular sieve, preferentially adsorbing the target gas species at high pressure. The process then swings to low pressure to desorb the adsorbed material. One of the primary applications of PSA is in the removal of carbon dioxide (CO2) as the final step in the large-scale commercial synthesis of hydrogen (H2) for use in oil refineries and in the production of ammonia (NH3). Refineries often use PSA technology in the removal of hydrogen sulfide (H2S) from hydrogen feed and recycle streams of hydro treating and hydro cracking units. Another application of PSA is the separation of carbon dioxide from biogas to increase the methane (CH4) content. Through PSA the biogas can be upgraded to a quality similar to natural gas. · Hypoxic air fire prevention systems to produce air with low oxygen content. · On purpose propylene plants via propane dehydrogenation. They consist of a selective media for the preferred adsorption of methane and ethane over hydrogen. · Small-scale production of reasonable purity oxygen or nitrogen from air. · PSA technology has a major use in the medical industry to produce oxygen,particularly in remote or inaccessible parts of the world where bulk cryogenic or compressed cylinder storage is not possible. Nitrogen generator units which employ the PSA technique to produce high purity nitrogen gas (up to 99.9995%) from a supply of compressed air. PSA has also been discussed as a future alternative to the non-re-generable sorbent technology used in space suit Primary Life Support Systems, in order to save weight and extend the operating time of the suit. ATMOS POWER PVT LTD manufacturers PSA Nitrogen Gas Generators (Inert Gas) which produce high purity nitrogen from compressed air,allowing continuous availability at a very competitive cost, compared to alternative supply with nitrogen gas cylinders or cryogenic liquid nitrogen storage tank.Each nitrogen system canbe equipped with a nitrogen gas analyzer to monitor the purity of N2 gas continuously. Return on investment is less than 2 years. Independence from external gas supplier & from fluctuation of the nitrogen gas market price. Suppression of logistic operations with cylinders or liquid nitrogen and supplier management. Modula,Flexible and low maintenance units as compared to cryogenic liquid nitrogen plants. Capacity : 1 Nm3/hr to 1500 Nm3/hr. ATMOS POWER PVT LTD Manufactures PSA Nitrogen Gas Generators (Inert Gas) which produce high purity Nitrogen from compressed air, allowing continuous availability at a very competitive cost, compared to alternative supply with Nitrogen Gas cylinders or cryogenic Liquid N2 Storage tank. 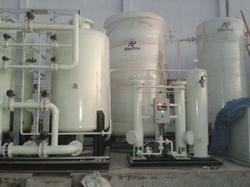 Each Nitrogen system can be equipped with a Nitrogen Gas Analyzer to monitor the purity of N2 Gas continuously. NITROGEN N2 Gas Generator plant eliminates all disadvantages associated to the purchase and operation costs of high- pressure N2 cylinder systems or cryogenic nitrogen gas storage tanks, enabling a permanent source of onsite NITROGEN, with minimum energy consumption and maintenance requirements. PSA NITROGEN Gas Plant is designed to be easily installed in any indoor facility requiring only a compressed air line and a power connection. With purities up to 99.9999% of N2, NITROGEN Gas can be connected to an external buffer allowing a reserve or a delay of production/consumption in accordance to the needs of each application. Independence from external gas suppliers and from fluctuation of the nitrogen gas market price. 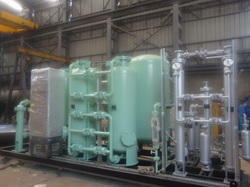 Modular, flexible and low maintenance units as compared to Cryogenic Liquid Nitrogen plants. Don't waste more money with Nitrogen Cylinders /Cryogenic Liquid N2 tanks. - Nitrogen Gas pressure : - up to 350 bar. * Generates Nitrogen as and when required. - Generates Nitrogen at almost 1/10th cost of nitrogen cylinder. - Fully Automatic Operation requiring no special attention. - Generates Nitrogen as and when required Plug It, Switch On & Forget. - Easy to install and maintain Skid Mounted & pre commissioned. - Pay back Period is very attractive. * Complete Inertization System For Cement Plants. We Undertake complete Inertization systems including design, supply and erection of inertization systems for Coal Mill & Classifier areas, bag Filter, Process bag filter, fine Coal bin areas & Pulse jet section of cements plant. Looking for PSA Nitrogen Gas Plants ?